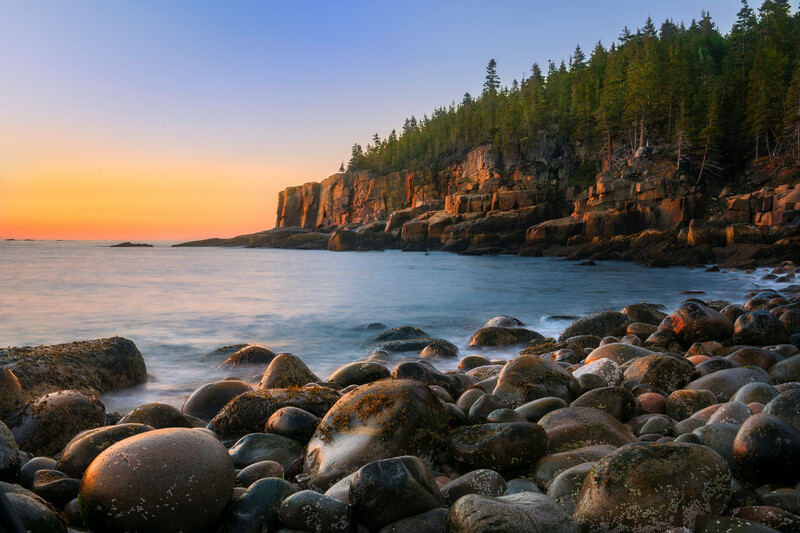 The first golden rays of sunlight illuminate the iconic Otter Cliffs on Maine's Acadian coast. This is the "horizontal" version print in our catalog. If you need a vertical (more narrow than wide) we have a beautiful version as well! One of the most prolific scenes on the eastern seaboard is the natural formation of Otter Cliffs as viewed from the beautifully sculpted and equally impressive Boulder beach. Captured as a long timed exposure, the technique artistically renders the rythmic waves pounding the coastline as an ethereal glow. This Fine Art nature image has stunning sharpness and depth of field and is extremely impressive as an Acrylic Print using our amazing Lexjet Fine Art metallic surface paper. The presentation as such truly allows it's luminescence and remarkable details to emerge.